Tracy Morgan is coming back! For those who are unfamiliar, Morgan is a legendary comedian who came from a tough childhood to making millions of people laugh. He appeared in movies, TV series, and Saturday Night Live. Netflix recently advertised “Staying Alive”, Morgan’s first special in a few years. A few years ago, in 2014, Morgan was involved in a serious accident. A truck driver was traveling at 65mph and was too slow to react to a construction zone speed of 45mph. The truck hit Morgan’s limo. The impact caused a chain reaction. The crash sent Morgan into a 2-week coma, killed Morgan’s mentor, and affected a total of 21 people. How did this crash happen? Investigators found that the truck driver had been awake for an astonishing 28 hours before the crash. They said that had the driver been alert and slowed his truck to the traffic limit, the crash would have been prevented. Unfortunately, fatigue is still a leading cause of crashes. In fact, worldwide, drowsy driving leads to a cost of $109 billion. In an average year, fatigue causes 328K crashes, 109K injuries, and 6400 deaths. One recent effort to combat fatigue is the electronic logging (ELD) mandate. Starting in December 2017, the FMCSA is requiring ELDs for trucks operating in the US. A similar mandate is being finalized in Canada. How does the ELD mandate combat driver fatigue? Traditionally, drivers record their driving hours on paper. These records, however, may be accidentally or even deliberately inaccurate. Electronic logs automatically record hours when trucks are running. This gets drowsy drivers off the road by alerting drivers when they need to stop. Other than the ELD mandate, what are other ways for safety managers and drivers to stop fatigue? People are recommended to get about 7-8 hours of sleep. Easier said than done! For some people, especially truckers, it is hard to keep a consistent schedule. As an alternative, drivers might want to consider changing their sleeping schedule. A great way to squeeze in 7 or 8 hours is to consider taking short naps throughout the day. The National Sleep Foundation found that taking a 40-minute nap improved alertness by 100%. Consider bringing music, earphones, sleep masks or whatever helps to fall asleep! 2) Don’t fall for diet traps. Quick fixes such as fast food and coffee sound tempting. As Star War’s Admiral Ackbar would warn, “It’s a trap!”. These foods lead to fatigue. Fast food is high in body fat and digesting this would take away the body’s energy. Coffee, although giving a short burst of energy, increases a chemical in our body that leads to tiredness throughout the rest of the day. 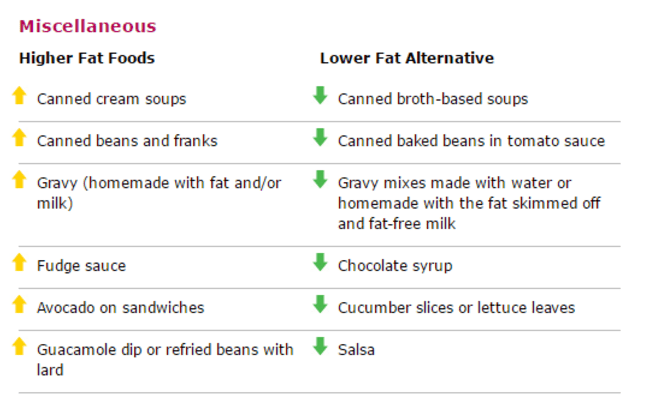 A handy guide was made by the National Heart, Lung & Blood Institute to recommend healthier alternatives. For example, instead of instant noodles, why not try pasta? Research shows that regular, low-intensity exercise reduces fatigue by up to 65%. How can drivers get regular exercise while being on the road? Dubbed as America’s fittest truck driver, Siphiwe Baleka shared a video about his 4-Minute Routine. He keeps active by anything from shadowboxing to lunges. These exercises do not require a gym, improves health, and keeps drivers awake on the road.